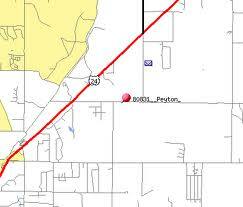 Peyton Colorado is a wide open escape from the city, while having plenty of shopping and schools nearby. Images of horses galloping through grassland fields and sunsets against a mountain backdrop define this countryside retreat. With a median sale price of $254,900 Peyton features nice homes that are affordable; and with a population of 15,892 in this vast area there is certainly some elbow room! One of the favorite spots among the locals is the Homestead Ranch Park. This is a secluded park that is not crowded and offers picnic pavilions, a large playground for the kids, a pond for fishing and plenty of trails. Also near Peyton is the Corral Bluffs Open Space, which also provides many miles of trails. Most of the students here attend Peyton High School in Peyton District 23. The renowned Colorado Academy of Independent Learners is also located here. The 'CA' is known for small class sized with close student/teacher interaction and an innovative and rigorous curriculum rooted in the liberal arts and sciences. Hwy 24 is the main road in Peyton and connects it with Falcon and Peterson AFB as well as Downtown Colorado Springs to the west. Peyton Hwy goes south and is a quick way to get to Schriever AFB. Elbert Rd and Bradshaw Rd's are also major roads in the area. Peyton has a lot to offer those that seek to escape the rat race of the city and have a little peace and quiet. With its great views, wide open spaces, ease of access to military bases and top-notch schools, it is a great place to call home. Search the #1 site for Peyton Real Estate listings.